PRIMIR, the Print Industries Market Information and Research Organization, the research unit of NPES, recently published a new research study: Tag & Label Printing Trends. The tag & label market includes four unique label types–pressure-sensitive, in-mold, sleeve, and glue applied—as well as tags. The PRIMIR study indicates that the North American tag & label industry dollar volume, currently at $12.9 billion, is expected to grow at a rate of 1.6% CAGR 2013-2018. Pressure-sensitive labels, which represent the largest market share, are expected to grow at an overall rate of 2.3% CAGR. Covering the North American tag & label market, this study provides an understanding of the current and future functionality of tags & labels by format and end-use market segments. The relative size of market segments and forecasts through 2018 are also provided. In this study, conducted for PRIMIR by LPC and AWA, more than 250 brand owners, packaging buyers, and tag & label printers and converters participated in surveys and qualitative interviews. Those brand owners and packaging buyers sourced more than $1 billion worth of tags & labels in 2013, while tag & label printer respondents had combined revenues of more than $2 billion in 2013. 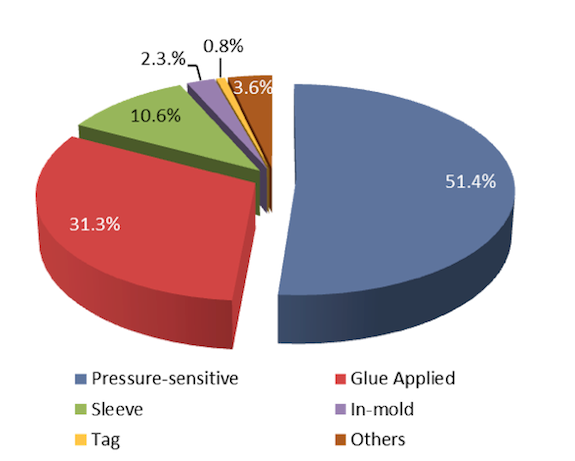 While pressure-sensitive labels will enjoy a healthy growth rate through 2018, glue-applied labels, at the opposite end of the spectrum, will continue to decline with a forecast CAGR of -0.2%. Sleeve label technologies including heat-shrink sleeves, stretch sleeves and RFS/ROSO MD sleeves, enjoyed a growth rate of 2.9% from 2012 to 2013 and are expected to grow at a CAGR of 3.4% through 2018. Another strong area is in-mold labels which is forecast for a CAGR of 2.9% growth rate through the period. Approximately 65% of North America’s tag & label production is printed with flexography. Offset has the second highest market share in North America. Approximately 85% of production is sheetfed; 15% is roll-fed (web) offset. Sheetfed offset is declining as pressure-sensitive flexo-printed labels continue to dominate. However, web offset presses that can handle paper and film applications are favored in the food, beverage, health and beauty/cosmetics and household cleaners markets. Gravure’s core strength is its ability to print high-quality, complex graphics in addition to high-density solids using the same engraved cylinder. This attribute has carved a niche in beverage labels for gravure, primarily in the beer and high-run size spirits sectors. Lastly, the evolution of UV flexo led to a sharp decline in letterpress in all tag & label segments. Digital color inkjet continues to make major strides in print quality levels and press speeds, resulting in increasing market share in the tag & label marketplace. Both printers and brand owners are interested in inkjet due to wider presses, lower consumables costs and increasing press speeds. In fact, the PRIMIR study revealed that the North American tag & label industry is considered one of the most innovative of the print segments, with an estimated 9%-10% of its work produced on digital printing presses. Digital production volumes are projected to grow at 17%-18% CAGR over the next five years. In an effort to standardize print quality and consistency across global markets, major brand owners are demanding specific press types and selected material manufacturer constructions. Print process bias is still apparent in the North American tag & label sector; despite its large market share, even when flexo can prove itself against offset and gravure, brand owners still view flexo somewhat negatively. Of brand owners interviewed, 55% said, “Yes, it [print process] absolutely matters.” Further, the majority of brand owners that have a process bias say they believe offset, gravure and electrophotography deliver superior print quality over flexo. Across the globe, brand owners are decreasing the number of tag & label vendors they use. Today, the average is two to three—many brand owners stated that they prefer a “one-stop shop” allowing them to purchase labels, flexible packaging and/or folding cartons from one source. More significant: 41% of brand owners said that being a one-stop shop may enable a label converter to be a candidate for other printed packaging products. Run lengths in North America are declining an estimated 7-9% annually. Every year, higher volumes of once conventionally printed applications migrate to digital printing presses. 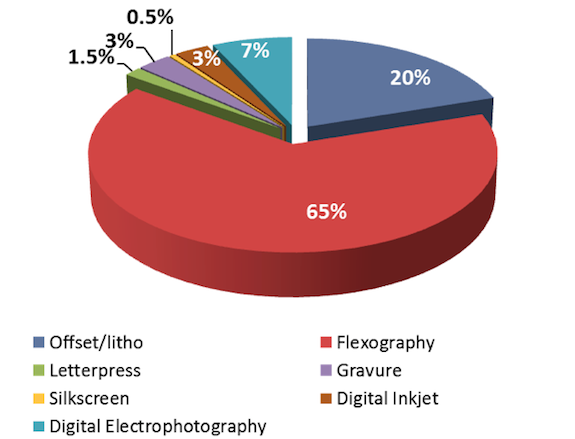 The study revealed that by 2018, 50% of the presses installed in the tag & label segment will be digital. There will, however, be a market for conventional presses as the demand for run sizes outside of digital’s reach continues. It is important to understand that as tags & labels become more commoditized, printers will have to offer their customers a total solution, which may include both digital and conventional press solutions. Finally, each year, more and more brand owners are making environmental sustainability a high priority. Over a third of brand owners noted they anticipate that environmental certification will become a requirement for tag & label converters within the next two years; 8% said they were already requiring certification. The most successful label converters of the future will be able to meet the needs and service requirements of their customers’ entire portfolios. From the longest and shortest runs, to the creation of samples and prototypes, to the management of inventories and complex workflows, the successful label printer will be embedded into all facets of their customers’ businesses. The “Tag & Label Print Trends” research study was recently distributed to all members of PRIMIR. An informative overview podcast (http://tinyurl.com/pejclpz), by LPC study authors, can be accessed complimentarily at the PRIMIR website on the Tag & Label Printing Trends page. For more information contact Rekha Ratnam, Assistant Director, Market Data/Research, at phone: 703/264-7200, e-mail: rratnam@primir.org, or visit: www.primir.org.